Inman Gallery is pleased to present a solo exhibition of new work by Katrina Moorhead. Moorhead’s practice encompasses drawing, sculpture and installation, creating rich tableaux that reconsider our relationship to nature, to a richly-layered past, and to a precarious present. For this, Moorhead’s second solo exhibition with Inman Gallery, she presents an installation of sculpture and drawings collectively titled a darkling plain. The exhibition is inspired by the very real phenomenon by which, due to volcanic activity, land masses can appear and disappear in the span of a human life. In seven works, Moorhead collides geological time with personal desire, creating an installation fraught with feelings of discovery, possession, and loss. A “Map of Incomplete Listing of Uninhabited Islands of the World, April 2009″ charts thousands of unpopulated landmasses on the globe. With the major continents removed, the map becomes a chart of possibilities – documenting places one could escape to if needed, or more darkly, spaces not yet conquered. Drawings of nuée ardente, (French for “glowing clouds”), actually reveal the slow build-up of underwater volcanoes—as well as the patient labor of Moorhead’s own hand. 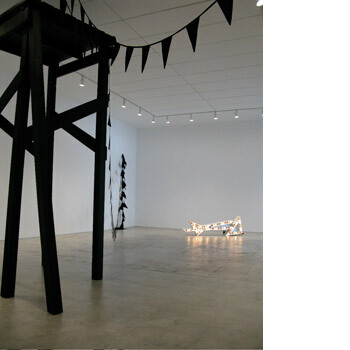 In the main gallery, black bunting dangles from a shadowy pier-like structure, poised somewhere between standing and falling, presence and absence. Similarly, a blinking bent arrow with a chalkboard surface points ground-ward, suggesting “here” could be anywhere, or nowhere. Throughout, Moorhead evokes a landscape, and a sense of place, that recedes as it emerges: there is the feeling that you have found what you were searching for, but once you have, it has already been lost. Katrina Moorhead was born in Northern Ireland in 1971. She earned her MFA and BA from the Edinburgh College of Art, Heriot-Watt University, Edinburgh, Scotland. From 1996-98 she was an artist resident in the Core Progam, Museum of Fine Arts, Houston. She was also artist-in-residence at ArtPace San Antonio, Texas (2005) and a resident at the SIM Gueststudio, Reykjavik – Association of Icelandic Visual Artists, Reykjavik Art Museum, Iceland (2006). Moorhead’s recent solo exhibitions include A Thing Called Early Blur, Blaffer Gallery, The Art Museum of the University of Houston (2007); and Katrina Moorhead, James Harris Gallery, Seattle, Washington (2007). Her work was included in the group exhibition The Nature of Things, representing Northern Ireland at the 2005 Venice Biennale. Moorhead won the 2007 Texas Art Prize (a biennial prize sponsored by Arthouse, Austin), and was recently awarded a Joan Mitchell Foundation Award for Painters and Sculptors (2008). Conversation with artist Katrina Moorhead and Michelle White, Menil Collection, Houston. Michelle White is Assistant Curator at The Menil Collection, regional editor of Art Lies, and contributor to Art Papers. She is currently organizing an exhibition on documents of Nouveau Réalist performance, and is a co-curator of Richard Serra’s drawing retrospective, opening in 2011. This will be an informal discussion in the main gallery of the exhibition and the public is invited. For more information, please contact the gallery at 713.526.7800 or info [​at​] inmangallery.com.